the staff, Dr. Holtan, everyone has been absolutely marvelous. 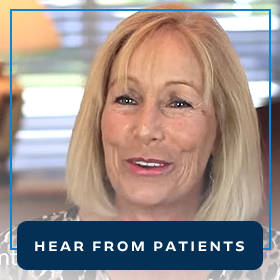 “I originally scoured the internet to find out about the “all on 4 implants”…basically doing my entire lower jaw. After reading up on the process and cost I scheduled an appointment with Dr. Holtan to learn more about the process (and cost). He checked my “bone” to see if I was a candidate and then we scheduled a date for the procedure. You go in….go to sleep and wake up with the temps already in place. No pain!! Back in a few months to have the permanents put in and check up on the implants. Could not be more pleased with the results after a year!! Easy to maintain (water pic works great)…takes me back 20 years when I had my own. Dr. Holtan’s Office is full of caring professionals that make you feel at home. “We were very fortunate to be able to help Mr. Perry Como with his dentistry. Mr. “C” was one of the most popular vocalists between the end of World War II and the rise of Rock & Roll in the mid 50’s. Are you ready to make a change? Schedule your complimentary consult now.